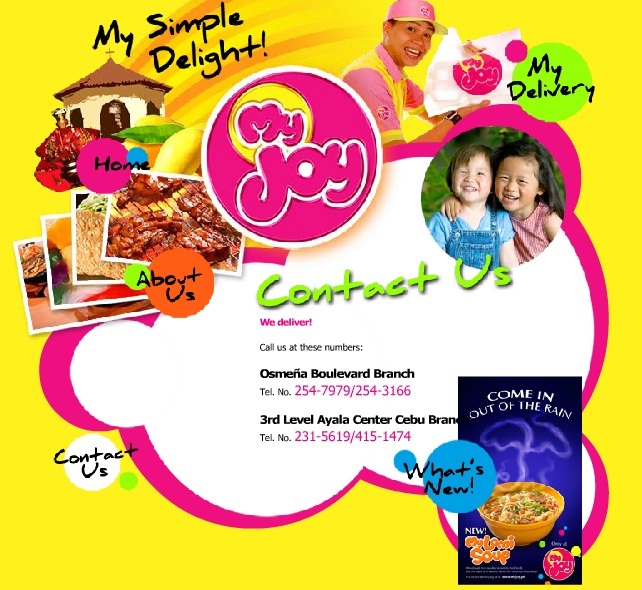 MyJoy is one of those establishments that pioneered in Cebu. They are now over 20 years in the food business. I did not know about that until I visited their website today. :P They have two store locations, one in Osmeña Boulevard in Colon and of course the one in Ayala. We headed out to Ayala to unwind after a swampy day. Hunger was foreseen and we were in a short bout between Harbor City and My Joy. I opted for the latter cause I have been curious about this place since I saw one in Colon. We went in on this brightly-colored place and headed out to the counter to order. I had the Palabok Set and my friend decided on the Burger Set. We had to wait for a few moments cause they'd still cook the palabok. And so we waited. This came after what seemed like 5 minutes or so. The server arranged the meal on the table and had a ketchup bottle with him. So there it was, a teeny weeny baby coachroach. I got the ketchup bottle trying my best to knock the roach off the bottle and hopefully kill it. After a few attempts, it eventually fell off. I let that slide. I was hoping that the food will pay off with the food that I will have today. So, I started to mix the calamansi juice to the freshly-cooked palabok. I was a bit excited to have a taste because I was beyond hungry! :~ :c OMG! The palabok was totally cold! My heart sank. Total utterly disappointed! What was this?! I was really hungry and I could really admit that I was too tired to complain. It even had an odd aftertaste as well. It seemed like an old batch of palabok, "This tastes like an old book..." I haven't had my share of an old book and I would probably say it totally tasted that way. You know how we eat, we seem to smell the food we are chewing and it tasted like an old book to me and it sort of lingered on your taste buds for a while. Total and utter disbelief! The Ice Tea Shake was a bit fun. I never had Ice Tea Shake like this. This is the result of ice tea + water and ice. It had this pineapple taste to it which was nice, it helped me numb my tongue. It did the trick in flushing off the bad taste I had in my mouth. Just like their interiors their website was of the same color scheme. Wanna Eat at IT Park (JP Morgan building) is also MyJoy, I think. Their portion sizes are a disappointment in my opinion, though I've only tried three items from their menu: spaghetti, taco, and pork belly. Of the three? Nothing to rave about. Hehehe. Hi Mustachio! I noticed that too! Gaaaaah! The tables will turn soon. :P I heard the halo-halo is worth a try, I might but not anytime soon.